Overgrazing has caused topsoil to dry up and blow away. Montana ranchers are helping to create a healthy environment by using innovative new ways to raise beef. This activity book will have kids in grades K-4 up to their elbows in the study of soil formation, habitats, soil animals, land use and soil conservation. Includes teacher-tested lesson plans, assessment methods and suggestions for further study. Integrates science with art, geography, language arts, math and social studies. Perfect introduction to soil study for young children who usually need little encouragement to go play in the soil. Describes the forces of erosion as caused by glaciers, water, and wind, how they affect the earth's surface, and how their destructive effects can be prevented. ​Provides students with dramatic simulation of natural processes such as river erosion, depositing and layering of sediment, rock formation, and the embedding of organic materials to form fossils. 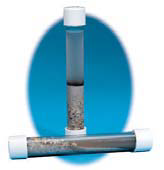 Two sediment tubes, plus teacher and student information with activities, are included. Can be used in conjunction with a stream table. The separates alone are only the beginning of soil textural study, since they are not found pure in nature but are always mixed. It is the natural mixture found in the field and known as soil classes - sands, loams, and clays - that are important. In glass jars on block base. 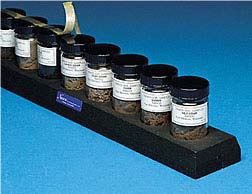 Set of 8 includes soils classes of sand, sandy loam, clay loam, peat, loam, silt loam, clay, muck. 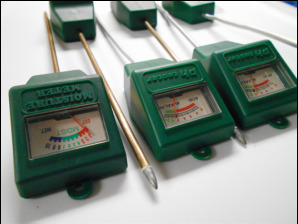 Instrument for collecting shallow soil samples. Designed for middle school students, this exemplary curriculum helps students examine, discover, and compare the physical and chemical properties of soil. Divided into seven units, each includes a complete set of lecture materials, illustrated handouts, teacher's tips, test procedures, data sheets, and games to reinforce concepts. 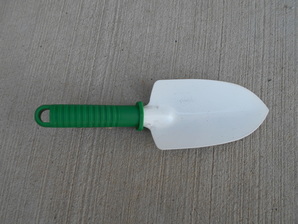 Covers all key soil tests, including texture, pH, nitrogen, phosphorous, and potassium. Uses reagent tablets, individually sealed in foil strips. Enough tablets and sample test bags for a class of 40 students. 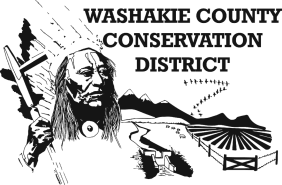 ​Special mounted collection consisting of 50 rock and mineral specimens that reflect those found in the Western United States. Specimens measure approximately 3/4” across. Includes Rocks and Minerals Study Guide. Perfect starter set for grades 5-12. 25 identified specimens with guide. 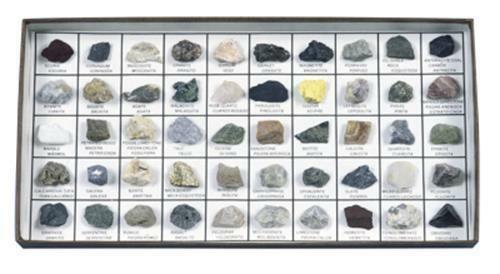 ​ Introduce your students to rocks, minerals, and fossils through a hands-on classification activity. The excitement of the field trip experience is created as they sort and classify the various specimens in the kit. Also includes a 4-page teacher's guide and 11 student worksheets with keys for use by the students in the identification and classification of each specimen. 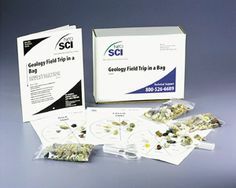 Kit contains 5 hand magnifiers, 2 bags of rough mineral samples, and 20 plastic sorting trays. A teacher's aid linking agriculture to science. Students will learn to rear worms, experiment with composting, and explore what makes healthy soil. This simple, easy to set up and maintain worm composting bin is attractive and... well... "worm friendly". Legs keep the bin off the tray, which catches any excess water that can drain out of holes in the bottom of the bin.